Fertilization helps to keep your lawn healthy and maintain that desired green color. It's important to apply fertilizer at the right time of year and at the right amount, otherwise you will end up with a mediocre lawn. Over-fertilization can cause random patches of long grass, giving your lawn an uneven look. Under-fertilization can cause sparser, less full looking lawns, and makes it easier for weeds and disease to take hold. We recommend using a soil analysis test kit or taking a sample of your soil to your local cooperative extension so your soil can be analyzed to determine what nutrients your soil is lacking. The healthiest, hardiest lawns are fertilized 2-4 times per year, fall, summer, early spring and late spring. The height and frequency that you mow your lawn affects your lawn's health and appearance. For example, mowing too short can make your grass more susceptible to diseases and you will have to cut it more often to keep it healthy. A good rule of thumb is to never remove more than 1/3 of the length of the grass blades at a time. Most grass types are the most healthy when they are between 2-3 inches in length. Mowing your lawn as needed is important, but keep in mind when applying any fertilizer, weed control product, or insecticide to your lawn to read the label very carefully. Some products will require mowing before application, and some require mowing after application. During spring you may need to mow as often as once per week. During summer mowing is less frequent and usually once every 2 weeks is sufficient. Finally during fall as the temperatures start to drop you may need to mow once a month until the grass starts to go into a dormant stage and mowing will cease. This typically happens once temperatures start consistently reaching 50-55 F for about 1 week. Watering is most often done to maintain color during the summer. Watering your lawn briefly and frequently leads to shallow, weak root systems. Aim for longer, infrequent irrigation to keep roots deep and robust. Keep in mind that while proper watering will keep lawns looking good, it won't fix other lawn issues. Silt soils, clay soils, and heavy foot traffic can compact soils, which creates a barrier from air, water, and nutrients to the roots and can inhibit grass growth. Compacted soils can lead to pest and maintenance problems if not properly maintained, making it easier for weeds and diseases to affect your lawn. Core aeration is the best way to break up compacted soil. An aeration machine can be rented to take cores of earth out of larger lawns and a hand corer will work for smaller areas. The removed cores can be left on your lawn for extra nutrients, and the holes left in your yard will be filled in with new grass. If you do plan to schedule an aeration for your lawn it is important that any pre-emergent herbicide be applied after the aeration is completed. Aeration can be done spring-summer excess moisture is known to sit on the grass. Thatch occurs when new grass grows before existing plant matter can decompose, causing a buildup of grass material. When allowed to build up, thatch creates a barrier to air, water, and nutrients to the soil and can cause new grass to have roots in the thatch rather than the soil. It can prevent fertilizers or pesticides from penetrating into the soil, and can harbor disease causing bacteria, fungus, and insects. Using a vericutting machine or power raking are ways to remove the excess thatch, but sometimes aeration can accomplish a similar result. If you do plan to schedule a dethatching for your lawn it is important that any pre-emergent herbicide be applied after the dethatching is completed. Unsightly weeds can break up the color and texture of your lawn, and once weeds move in, they take nutrients and water away from your grass. This can result in a thinned out lawn. Weeds are generally split into two categories - grassy and broadleaf. Pre-emergent or post-emergent weed control products will help to control almost any weed you have in your lawn. Pre-emergent products kill weeds before they are able to grow above the soil. It is important to apply pre-emergents just before the soil reaches 55+ degrees, just before the seeds begin to germinate in the soil. Timing is very important! Please be sure sure to refer to the product label for mowing restrictions prior to and after herbicide applications as mowing can negatively impact the efficacy of the herbicide. 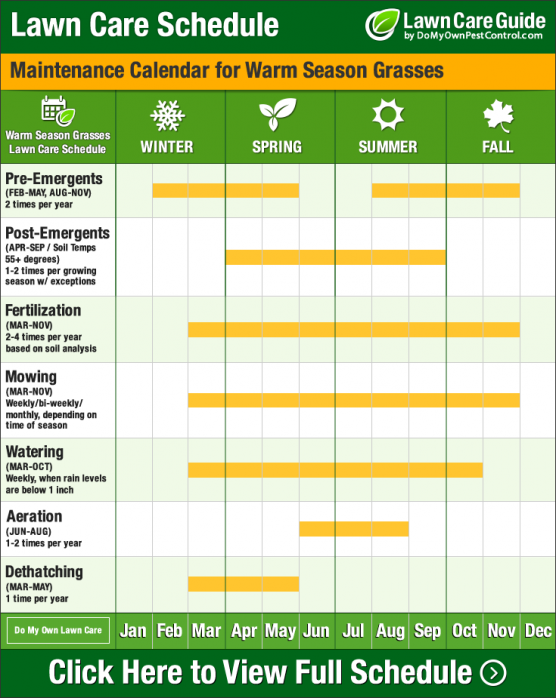 Post-emergent products kill already-growing weeds, and you can choose many different types of these products. Note that some will not harm foliage other than the target weed (called selective) while non-selective will kill any plant it comes in contact with, including your grass. Please be sure sure to refer to the product label for mowing restrictions prior to and after herbicide applications as mowing can negatively impact the efficacy of the herbicide. A post emergent can be used as early as April in warm regions. 579 of 595 people found this article informative and helpful.